Dear OBPS: Thanks for sharing that cautionary tale. I’ve quit more than my fair share of jobs, but my dad instilled a principle that has always stuck with me: “Never have an acrimonious departure” — and it’s even more important to the freelancer or would-be freelancer. Leaving after just two months doesn’t necessarily qualify as acrimonious, but it certainly could be considered discourteous for the inconvenience and costs to the employer. Which is not to say that you should stay in a bad situation, only to state that you need to be aware that there are consequences. The simple reason for leaving on good terms and avoiding burning bridges, as in the example here, is that you might want work from your former employer. I left my last job on amicable-but-not-smiley-happy terms with my boss, though I still had good relationships with staff members. 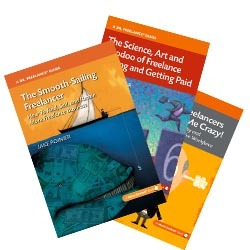 Out of either principle or bullheadedness, I did not want to make the first contact to ask for freelance jobs; I didn’t want to look like I was struggling to make my freelance business work. That being said, I confess to being very pleased when someone from the company contacted me with an assignment after I’d been gone for 18 months or so! Today, I consider them a great client — our relationship is far better than it ever was when I was on staff. Any experiences with burning bridges out there? Please share in the comments. The fact is that we judge people not by how they enter but how they leave. It’s only natural that the last interaction we have with someone is the last thing we remember. Burning bridges is dangerous even if you truly believe that you will never work with again. There are tons of people who I would never want to work with again. But they don’t know that. Because I might just change my mind and it’s super hard to backtrack over a burnt out bridge. There have been so many times I wished I could burn a bridge, when it seemed like it would feel good to say exactly what I thought about a person or an organization. But I just don’t have it in me. Maybe it will turn out to be a good thing that I always leave with a “Thanks, I’ve learned a lot” attitude. If I had a nickel for every time I “ran into” my past life, I could probably retire. And, it’s not only former employers-just think, the person you insult today may be your next boss (or prospect) tomorrow. @P.S., that’s an insightful way of looking at it. And you’re right, particularly since there’s a bit of unknown to it all (in your head and others’), smarter to err on the side of caution. @dava, indulging your inner pyromaniac makes for great TV and movies, but is surely best left as daydreaming for those of us in the real world. You should be glad your personality leans that way! I definitely agree with you that we need not to burn bridges with our former or would be former employers. I used to work for a helpdesk company and I had to leave because of health reasons. Everybody including the boss has been good to me and they don’t want me to resign. They even allowed me to miss work for a few days because of my routine check ups, however, my doctor’s really want me to have a complete rest and not think about work for the meantime. So I asked for Medical Certificate and submitted it to my boss. It wasn’t at all easy to leave or to ask permission to leave, since they have been so kind and understanding with me. But I went through it, they were not at all that happy that I left, but I made sure that I did not burn bridges, as I have some friends who are still working with them and just like OBPS after a 6 months of rest they asked me to work for them again. I did not actually expect that, because I left them when they needed them the most. I guess , if a person really need to leave a company or an employer he needs to make sure to keep in constant contact to allow them to know what’s happening with you ( as if they really want to know), but kidding aside making them feel that they are still important to you is what makes the difference. @Melanie, glad to hear it turned out well for you. Your point about open, honest communication, and making them feel valued, is a good one — thanks! I was just talking to someone about this very topic. Thanks for confirming. Great post. Thanks for the kind words, Dennis — and for the tweet, too. Very sage advice. I’m tactful to a fault, but it has served me well: I managed to maintain a cordial relationship with a colleague who was challenging to work with, and as a result she contracted me for a very large and lucrative project. Biting my tongue all those years left but a small dent! Isn’t that a great feeling, Suzanne? With a tough cookie like that, the reality is you may have been one of very few people (maybe the only!) who was tactful/cordial with her — instantly putting you at the head of the pack when she needed someone she could trust and knew wouldn’t give her a bunch of friction. Nicely done. It’s always a very considered decision when I burn a bridge, and, in my case, it’s usually been because the employer has asked me to do something illegal or unethical and I have refused. I try to keep it cordial and professional, but there have been one or two cases where the relationship ended in flames. Usually, the employer wound up, in the aftermath, with, shall we say, legal difficulties (not brought on by me).